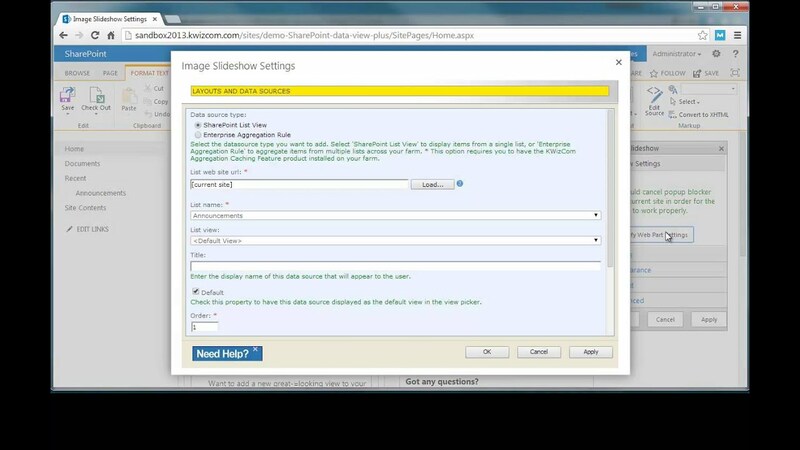 The KWizCom SharePoint Data View Plus web part enables you to easily create a customized, branded display for SharePoint lists and libraries, and for aggregated SharePoint items. This super-flexible viewer includes a set of great-looking, ready-to-use views such as Task-Accordion, Blog Spotlight, Image slideshow, News marquee and Upcoming birthdays. Save money! You do Not need to buy any of these as separate products. Data View Plus web part includes them all! But that’s not all: You can add your own custom branded display templates! All you need to do is copy the HTML code of your required view and use the web part’s dynamic tokens to quickly display aggregated data from your lists in the exact layout the you want, no need for any XSL messy code! Now you don’t have to get involved with complicated XSL development using SharePoint Designer, and you do not need to buy multiple web parts from vendors in order to implement some of the scenarios listed above! With KWizCom’s Data View Plus web part you have many of these scenarios already available, and you can easily add additional Display Layouts without any XSL development and at no additional cost! Easily view & manage remote SharePoint lists located in remote sites and servers!